Kell Brook's world title fight against Devon Alexander is in doubt after Floyd Mayweather claimed Alexander might be fighting him instead. Sheffield's Brook was scheduled to fight IBF welterweight champion Alexander in Detroit on 23 February. However, the fight was postponed for a second time when Alexander announced he had hurt a bicep in training. "The negotiations for my fight are almost done. The front-runner is Devon Alexander," tweeted Mayweather. However, Brook's promoter Eddie Hearn told BBC Sport: "We've got a signed contract for Kell Brook to fight for the IBF title. "If Alexander does take that fight [with Mayweather] we would certainly insist Alexander be stripped of his title. We'll fight for the vacant IBF title, next in line." Meanwhile, the IBF said it would not grant Alexander an exemption to fight Mayweather instead of Brook, who is the governing body's mandatory challenger. "We have not received any requests or information on this from either camp," the IBF said in a statement. "Because Alexander is under contract to fight Brook he would not be granted an exception to fight Mayweather." 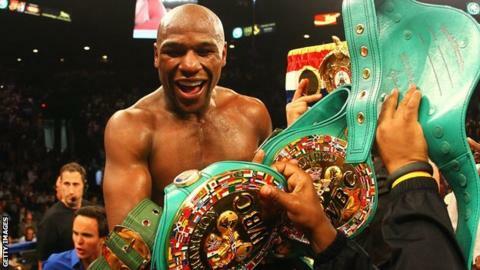 Undefeated five-weight world champion Mayweather is scheduled to fight in Las Vegas on 4 May, the day before Cinco de Mayo, a festival of Mexican heritage in the United States. That being the case, Robert Guerrero and Saul Alvarez had been floated as potential opponents, but Mayweather's comments have confused the situation. The Brook-Alexander bout was originally set for 19 January but was delayed when Brook hurt his ankle in December.